Surrounded by paper, that is—like invoices, reports, purchase orders, and scraps of paper where your engineers have scrawled down the faults they’ve discovered in a customer’s boiler and the parts they’ll need to fix it. Some of your employees are even printing out important emails, which instantly become lost in the chaos. Using electricity, ink, and paper to print out documents is bad for the environment, and many of your eco-minded customers would give you major points for using environmentally friendly processes. That electricity, ink, and paper we just mentioned? They all cost money to your business, too. Printing and storing documents wastes valuable time. Searching for documents among your office’s files and piles wastes even more valuable time. When your engineers rely on paper forms, those forms often get lost—and even when they don’t, you need a Ph.D. in ancient runes to decipher the engineers’ writing. Talk about a waste of time. When your engineers call the office to get information they need for a project, you have to wade through piles of paper to find the right info. And the most convincing argument for creating a paperless office may be that it can boost your profits. ‘Digitising documents and opting for a more paperless approach may result in faster payment from customers’, says Nicola Willis, Business Development Manager at Brother UK. That’s because you can send invoices more quickly when you have all the information you need accessible and ready to plug into an invoice, rather than having to compile information from hardcopy purchase orders, time schedules, and project notes. Read on to find out why it’s important to go (mostly) paperless...and how to do it. 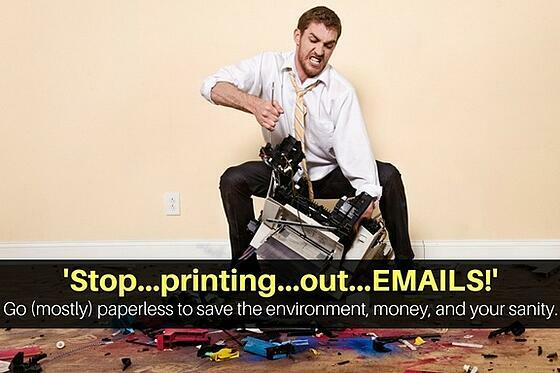 We’re not talking about eliminating every scrap of paper from your field service business, so don’t feel like you need to go 100% paperless or not bother at all. Many people, by nature, simply enjoy jotting notes in notebooks, on memos, and in the margins of magazines and books. There’s no point in trying to stifle this natural urge to take pen to paper, so the goal here is to decrease the unnecessary use of paper. For example, you might turn to apps to streamline your workflow or employee communications (more on this below), but keep using certain paper forms that your staff likes—and of course any forms that are required by government regulations. 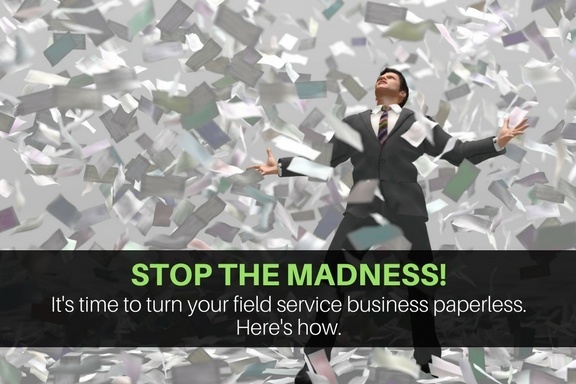 The first step to cutting down on paper pandemonium is to figure out where your field service business is experiencing wasted time and resources. Where are you discovering teetering piles of paper? What kinds of documents are being lost? Also, ‘Explore what's being printed out,’ says Willis. ‘Are there documents being left on the copier at the end of the day? If so, a print audit would help you understand if your business could benefit from a print management solution, which would help alleviate some of those unnecessary costs to the business and the environment’. Too busy to do your own print audit? Willis suggests calling in an outside consultant, who can help you to look at your business processes to identify which processes could benefit from being paperless, or at least less paper-heavy. It can be hard to sift through piles of paper, all of which look super, extra important, and decide what to keep in hardcopy form, what to digitise, and what to recycle. ‘There's only really one reason, outside of legalisation or regulatory requirements, to keep files in paper format’, says Willis. ‘And that’s if it's of a benefit to the business or to the customer. If it isn't, I would suggest sorting through it, auditing the paper files, and deciding what can be digitised and what can be recycled’. Of course, you’ll be scanning any important documents that you need to keep but don’t necessarily need in hardcopy form; however, you’ll find a lot more helpful tech tools besides office scanners that will help you move toward a paperless office. Many businesses have created apps and other solutions that let you create, track, and manage information without having to fire up your printer. For example, engineers in the field sometimes need to use paper forms. Mobile scanners and printers can help them increase their productivity, as they won’t feel the need to print out massive amounts of paper at the home office because they’re not sure exactly what they’ll need in the field and don’t want to be caught without a key document. Want even more handy tech tools to help you go paperless? With Brother's Managed Print Service for SMEs, you can lease printing hardware, manage your printing needs through a web portal, and pay on a per-click basis. More reading: Check out more technologies that can help you go paperless. If you have customers who prefer paper communications, you can at least keep your own office (mostly) paper-free by letting us here at Commusoft handle the task for you with our Print & Post feature. You simply purchase credits, and we use CFH Total Document Management Limited—one of the UK’s leading document outsource processors—to fulfill your print and post requests. Don’t store the files on your hard drive, because if your computer goes down—so do your files. Instead, keep them on a cloud-based storage platform like Google Docs or Dropbox, which also makes it possible for your entire staff to access the files. Use a standardised naming system for your files, and organise them in easy-to-find folders. If you’re not using a third-party document management service, which will back up your files for you, set up an automated backup process so you won’t lose the whole cache of files should the system go down. If you want to take more steps to secure your documents, encrypt or password-protect them as you scan them. These strategies will keep your impenetrable paper piles from turning into impenetrable digital piles. More reading: Short on time? Here’s how to go paperless in under 24 hours. Once you’ve taken the first steps towards going paperless, the biggest challenge may be getting your staff on board. ‘Ultimately, lots of people like paper. They're used to it’, says Willis. ‘It's like breaking up with an old friend. It's obviously not saying “no paper”...it's just educating your staff on how to use the paper that the business needs in a better way’. Train your employees to simply be more aware of the paper they’re creating. Do they really need to have that document in hardcopy form? Can they sign that document electronically rather than printing it out and signing it by hand? Are they struggling with piles of paper that could be digitised? Would it cause a problem if an employee were to lose or damage a particular document? Encouraging employees to think about these issues can dramatically reduce the amount of paper clutter in your business. Here’s something we’d like you to download but not print out: A free downloadable report that pulls together all the information we’ve shared on getting your field service business ready for the busy winter into a quick, concise list. That way you can have all the steps to prepping for a profitable heating season right at your fingertips. Look below, click, download, read (don’t print!) and get started today.